Connect the Raspberry Pi to the network or directly to your computer. Notice that you’ll need to configure the network settings so it can stream ‘internet’ through the network cable. I have a same problem with sailpi 2; how to fix it? I have the same problem. Can SSH to raspberry pi to reboot, but get stuck again on that same loading screen. any progress? found out what the problem was. hadn’t installed glacier. new problem though: after a few seconds of working gui the screen just goes black. Its also no longer possible to move the mouse. 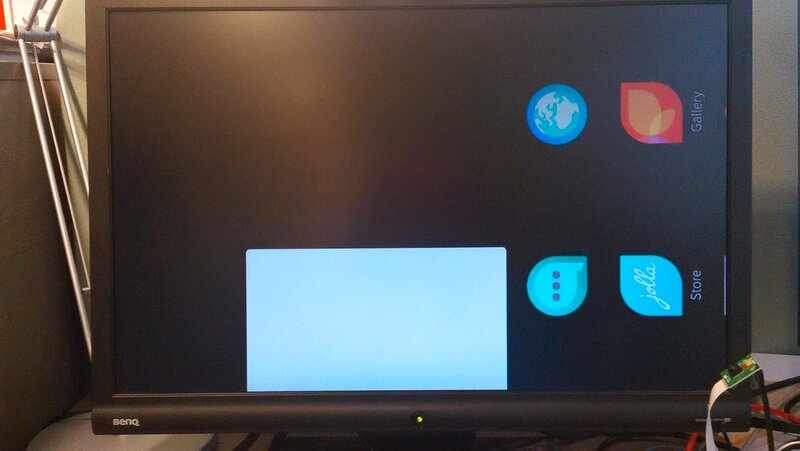 The official raspberry pi touchscreen is also not showing anything, but external monitor is. There are currently issues with the egl handling in Sailfish QPA plugin, fixes are coming when we have time to debug the issues. I don’t know how you managed to not get it working. But both locusf and I can assure you that it’s working on our Raspberry Pi2’s! Hi, what is the purpose of the gparted/format part of the instructions? IMHO the new image will overwrite whatever partition table and partitions/content the SD card had. After writing the image to SD card, rootfs filesystem was a bit broken (corrupted orphan linked list etc.). I also wonder why rpi-update is needed, in rasbpian it is really bleeding edge and generally not needed, and it also overwrites files from other (stable) packages (just try debsums -c after running rpi-update). Killing rpi-update does not sound like a great idea to me. After first boot I did not see sailfish desktop, whole screen is just lightgrey/white and mouse is stuck in upper left corner of the screen. Will try to run rpi-update and reboot now. Hi, you’re right, gparted/format is not needed. Rpi-update should not be needed now as I’ve done that now. It was needed when the system was clean in the previous image. As for killing rpi-update it is indeed not a good idea to kill it. But there is a hack in the image which puts a symlink for /opt/vc -> /usr so thats why the rpi-update script gets stuck at first. to regain control of your sailfish desktop. I’ll update the guide to match this, thanks for your comment! Hi, and thanks for quick reply! I did su nemo and systemctl –user stop voicecall-ui-prestart (double dash before user, no errors from systemctl) and since nothing happaned I rebooted but the whole screen is still lightgrey/white, and mouse is stuck. Ctrl-alt-del from the keyboard/mouse combo restarts the raspi so I guess it works. Mouse was working with the previous Image I tested, and then I was able to see sailfish desktop (but could not install glacier). Anything else I can do? I’m new to Jolla but have been using other distros a lot, mainly rasbian in raspi, but also a bit of pidora and osmc. I forgot that you also need to doubleclick on your mouse in order to “unlock” the screen, this should work out for you now. I tried with both single dash and double dash still the same. What did I do wrong? I am having similar problems as Paavo. Here is a picture showing the screen where it gets stuck. What is the best way to get news and updates about Sailfish OS on Raspberry Pi 2? Sorry that you are havIng trouble with this. The current installation instructions don’t provide a clear way to troubleshoot issues. I suggest you follow me on twitter to get updates on the project status. This is the cause for the screen to get stuck. Hi guys! That is awesome for running an new OS on rpi 2 ! May i ask you whether the RCA port will works or not on the Sailpi OS? Hi guys, I run the Glacier on Berryboot (I’m still retaining access to multiple distros). I managed to change the orientation to landscape. However the mouse cursor is still invisible. Any way to overcome the issue? Hi, any chance to get this working with the new Raspberry Pi touch screen? Ota yhteyttä twitterissä jos ei lähde pelittämään, teen jossain vaiheessa täysin imagen jossa on first-run tutoriaalit ja muut. Hello, When I boot I get to a language selection screen, but I cannot select the language via my keyboard. I can scroll through the list but nothing else. Is there a solution to this problem? Sorry, this is quite awkward, but Sailfish is not really designed to be controlled with a keyboard. This way the first run tutorial is skipped. Hey, I’m trying and trying to get it running on Pi2+7 inch original Raspberry touch screen and no success. Which image shall I be using? I tried 2.0.0.10 but stuck after the first boot and the selection of language and so on (the circle stopps turning after ~30sec). I connected via ssh and did a reboot (tried it several times) but it is always the same. I am also interested in using the original RPi display as Mario pointed out and would love to use a RPi3. Any progress on that? It seems that it got really quiet concerning SailPi. any luck or changes running sailfish off a pi zero with a piTFT? Hi Locusf. I’m using your Sailfish 2.0.0.10 Dev-Port on Raspberry Pi 3. Its working perfect, but how can i use the RPI3-internal WiFI Adapter? Do i need to copy FW-File? Hi, just find the FW file and you’re golden! Thanks locusf. I will copy the whole /lib/firmware folder from the Raspbian SD-Card to the SailfishOS SD-Card. I hope the wifi will work afterwars. How it looks like with OTA Updates. can i ssu re 2.0.2.51 or 2.0.4.14 and version –dup afterwards? Do i need special adaptation0 repo after each update? PS: Maybe you are somewhere on XMPP / IRC, where we can talk about sailpi port. Maybe IRC freenote #sailfish-porters ? [number] rpi_tf5406 rpi-ft5406: Touchscreen not detected. Olhem bem para o prÃ©dio, os sinais. Que porcaria, que desleixo! E no entanto, podia ser bem dieefentr. Apenas em Lisboa, ou alguma cidade em guerra civil, se podem ver estes cenÃ¡rios! time and I realised that is good written, easy to understand. I congratulate you for this research that I am going to tell to people friends.